Chinese President Xi Jinping visited Monaco on the French Riviera Sunday seeking to press ambitious commercial goals ahead of talks with France's Emmanuel Macron who is trying to forge a united European front to contend with Beijing's advances. 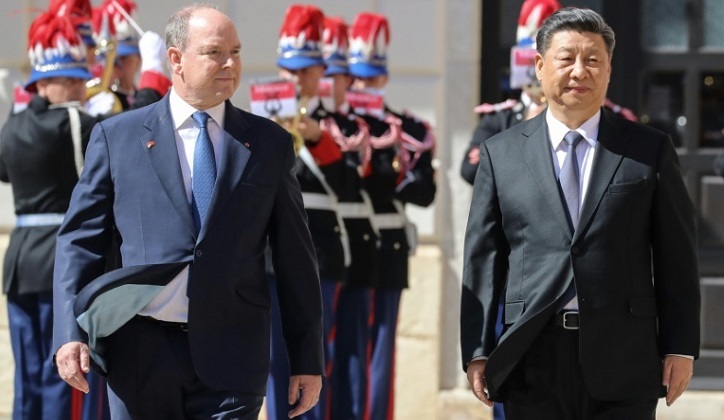 Xi arrived at the airport of the iconic resort city of Nice accompanied by his wife Peng Liyuan to be welcomed by French Foreign Minister Jean-Yves Le Drian and an honour guard. Prior meeting with Macron Xi went to the nearby principality of Monaco, where he was received by Prince Albert II and Princess Charlene. A Monaco government spokesman said bilateral talks would "address economic and environmental issues". Xi, who has made establishing China as a global player central to his government, travelled from Italy, whose government became the first G7 state to sign up to his landmark new "Silk Road" infrastructure project, a massive undertaking to join Asia to Europe. The project has raised eyebrows in Washington and in some EU capitals where critics say it will give China too much sway. Xi says it would be a two-way street of investment and trade. Earlier, German Foreign Minister Heiko Maas criticised Italy over its participation in the new Silk Road project. "In a world with giants like China, Russia or our partners in the United States, we can only survive if we are united as the EU. And if some countries believe that they can do clever business with the Chinese, then they will be surprised when they wake up and find themselves dependant," Maas told Welt am Sonntag newspaper. "China is not a liberal democracy," he added. Amid tight security, Xi and his wife were Sunday evening to join Macron and his wife for a private dinner at nearby Beaulieu-sur-Mer overlooking the Mediterranean during which they would have what a Chinese official termed "a deep exchange of views on Sino-French, Sino-European relations and international and issues of mutual interest." "If we're going to talk about a new Silk Road, then it must be one that goes in both directions," French Finance Minister Jean-Yves Le Drian told BFM television on Friday. Macron is also expected to urge Xi to commit to the ambitious global bid to cut carbon emissions, even if China is still building dozens of coal-burning power plants. France also plans to voice concerns about rights abuses against China's Uighur Muslim minority.